Scouting for new spots to hunt is time consuming, but sometimes it turns out to be well worth the effort. I discovered two out of the way outdoor basketball courts, side by side, which seem to always be busy with large groups of young men playing at almost any hour of the day. I'd been by at least a dozen times hoping to get a chance to hunt it, and it was always busy, even after dark. So, I decided to be an early riser this morning up before 6 and headed out before 7am to see if I could beat them to the court. I arrived to find empty courts and promptly started hunting the perimeter areas. It turned out to be my best clad day ever, and thankfully, the basketball guys to not carry many cent coins, mostly quarters. I hunted just under three hours (until users started showing up) with a total of 114 coins dug, mostly screwdriver removals. 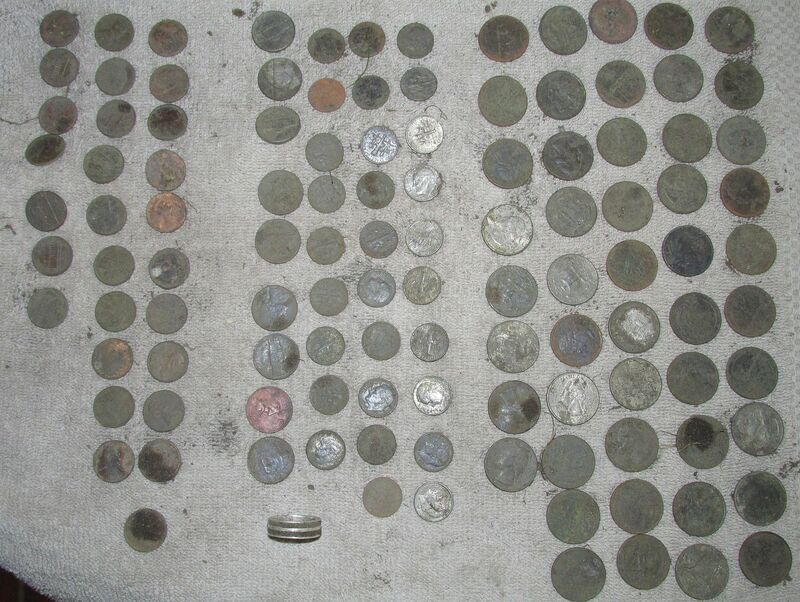 Total includes 48 quarters and 29 dimes, with 9 nickles and 27 cents. Plus a nice sterling men's ring and a Canada cent. My best day ever for clad.